!!! New - Updated with new data for Update 23.4 !!! This includes new items,runes,emotes, essences updates, new rep tier for dwarves of Erebor. !!! New - Updated with new data for Update 23.4.1 !!! This includes new items, mid-game items update, recipes REMOVAL! It's been a few month since version 9.0... So now here is version... 10.0 aka X!! See https://www.lotro.com/forums/showthr...tracker-maps-) for the previous version. This version includes a major revamp of a lot of internal mechanics. You can have a look at http://sourceforge.net/projects/lotrocompanion/. Just download the distribution archive, unzip and run (readme.txt file describes how to use it). Works on Windows 64bits (Java 8 included, with an Official Oracle Launcher), and also Linux and MacOS, using a shell script. It's also open source on github: https://github.com/dmorcellet/lotro-companion (see also child projects lotro-core, lotro-maps, lotro-tools...). Really cool! However, being a bit of a noob with tech things, I'm not sure how to use it. I downloaded the zip file and opened the program, but I'm not sure how to input my character. Can it pull it automatically or do I need to input everything individually? Sadly, this is manual input. - keep track of your toon(s): I do screenshot things from the game (gear, virtues, trait tree, racial traits) and enter that into the game. I successfully entered 10 toons and got <1% error on all stats. - simulate toons: there you don't need to have exact state of yours. I know I should write something like a user manual, but I just don't have time. I've been working a lot on the mechanics for this version. I should have more time for features in the future! Choosing the scaling level will compute the item level, and then the stats (armor and others). For some other items where there is no scaling level, just edit the item level. WOW! This app is amazing! Great job on it! Thank you for putting it together and giving it to the community. You rock! I was looking for a tool similar to this one, even thought about trying to make one myself although I'm still a bit of a rubish coder. 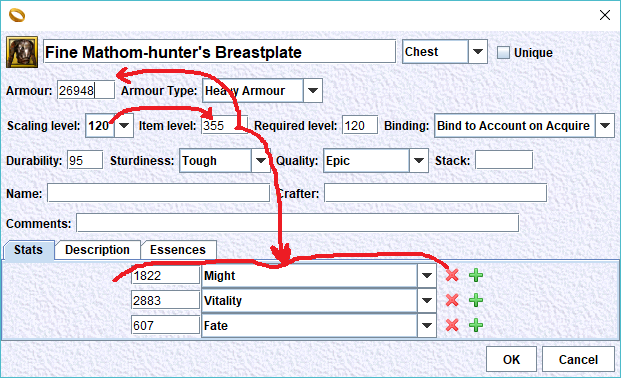 You might have this written up somewhere but do you have any plans to add a Quest database? I heard that the LOTRO API doesn't allow access to such information but maybe you could find a way around it? Besides that, what are your other future plans for this? This continues to be a wonderful tool. @Cordovan, get this community content creator some dev support!!!! I've never looked at the LUA.... anything... ever... so I have no idea what it entails or enables. I assume you know your business,ha. EDIT: whoopsies! I see now in my PM history that I sent him virtually an identical message back in May! haha. I hope I am forgiven. Last edited by Moondog548; Dec 31 2018 at 11:38 AM. Not to sound rude because this looks like an incredible amount of work, but I don’t understand what it is for. How would someone use this or what would it be used for? I know my question itself leads to the comment of me just not being an advanced enough player that it matters but it does look interesting and I can appreciate the amount of work even if I do not understand what it does. No problem, good question. As it started as a little application (to grab character log) in 2012, and has grown so big, I understand it can be not so clear for new users (and my own use changes with time...). It started in 2012 as a character status tracker. At the time, we had the 'my.lotro.com' site (and data.lotro.com, that I discovered too late) that would give us as web pages: character gear (just like the character panel ingame) and the character log (no equivalent in game): a table with dated character 'events': quest completions, deed completions, crafting status changes, level changes. The initial version of the application would just grab that from the web, store it locally for display. That gave versions 1.0, 2.0 and 3.0. As you may know, the services used for this have been stopped by Turbine around 2013. So this application became useless instantly. It took time for me to recover and to find a new use for the codebase. Here I'd like to thank Galuhad, author of the plugins 'Tulkas' and 'Item Treasury' and later Giseldah (see ratings to formula page on lotro-wiki). Those 2 made me think it was possible to build a Magelo-like tool for lotro. They helped me dive deep into the game mechanics. So there was a rebirth late 2016 and then came version 4.0 at the beginning of 2017. Version 5,6,7 were released in 2017, and then 8,9,10 in 2018. That is for the history... but that was not the question. 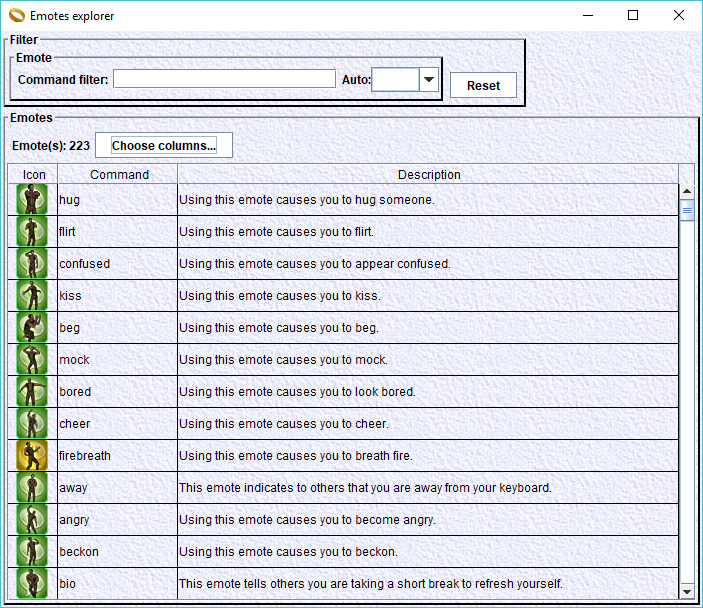 So the initial use was a character status tracker, and later a character simulation tool. This application will act like a notebook, where you can enter the state of your toon(s) and display some nice graphics from it. - storage (contents of bags, vaults): this is imported directly from the game, using plugins KikiInventory and AltInventory. - equipment: each slot can receive an item. 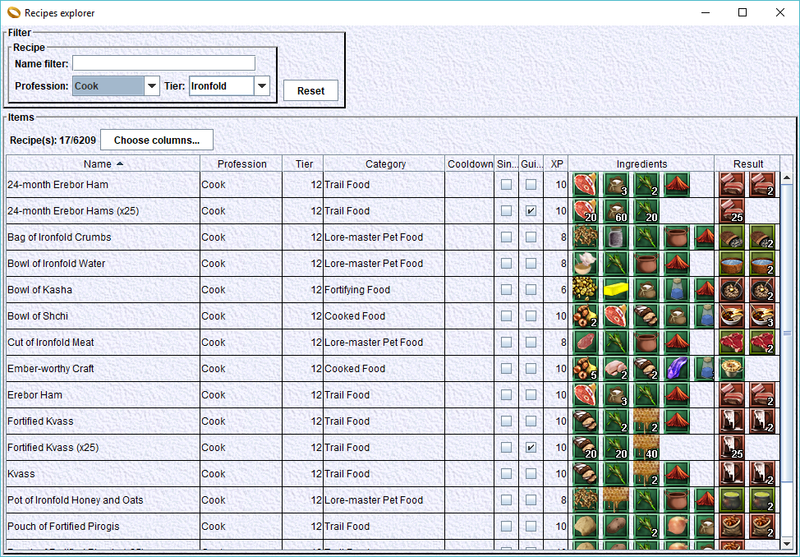 Each item is editable (stats, essences, relics...). - character stats are computed from the previous data. This is displayed in the character sheet. 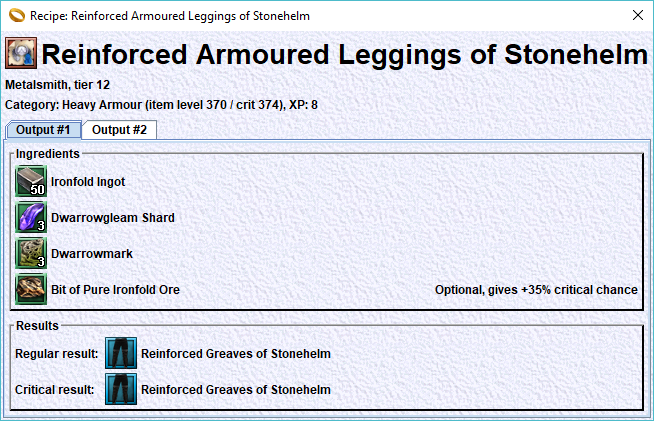 Details (like percentages, available as tooltips in the game) are available in a separate window. - analysis of the contribution of essences to the stats. Note that almost all these data have to be entered manually, since there is no true export of these from the game. - reputation overview: shows the current state of the several characters in all available factions. As we have 'character configurations', these can be used to keep track of the state of a character at certain dates, but it can also be used to make some simulation. 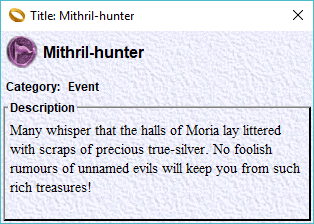 The application provides a full database of all available items and essences, so you can see what it gives to use this 'item you dream of' on your character. 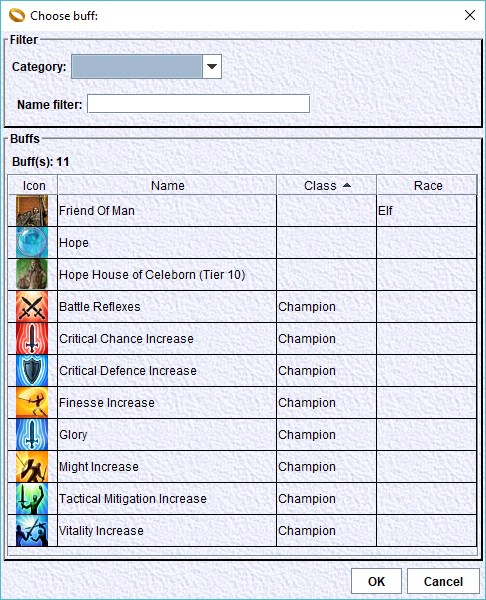 Now it also provides all race/class/trait tree 'buffs' that give stats. It has also all virtues and also stat tomes. It has almost all the formulas to compute stats: main stats, ratings and derived percentages (thanks Giseldah). - recipes: contains all the recipes of the game. - titles: contains all the titles of the game. - emotes: contains all the emotes of the game. I'll stop here. Thanks to all those that have read it all. I have tons of ideas for new features. It could have been a huge spreadsheet, but a desktop application is easier to use (but harder to code... thats my own problem, lol). - I don't want to pay a subscription for a server. - I'm not a phone app developer... yet. May be I'll write some server software to be able to share data among users. So if I got an essence box I could pre slot in the program a might essence and a physical mastery essence and see how they would directly effect my stats enabling a better choice? That is pretty amazing. You got it. That's one use. Before slotting the essence, display the 'details' window, and keep it open (it's big but non modal). Slot the essence. You'll see the diffs in the details window in red (-) or green (+). The 'details' window resets each time it is opened. That's useful to perform easy comparison like the one you suggested. This is nothing short of incredible. Thank you for your dedication!! /signed for some measure of SSG support! Congrats on a great tool. How about making some provision for apps like this to load your data, in stead of having to manually enter it? We used to have something like that before your time, and it sparked all kinds of wonderful add-ons. As it stands, I'll not use this for the bother of having to maintain the data manually. As a former web dev, there are so many possibilities that could be done without compromising security. 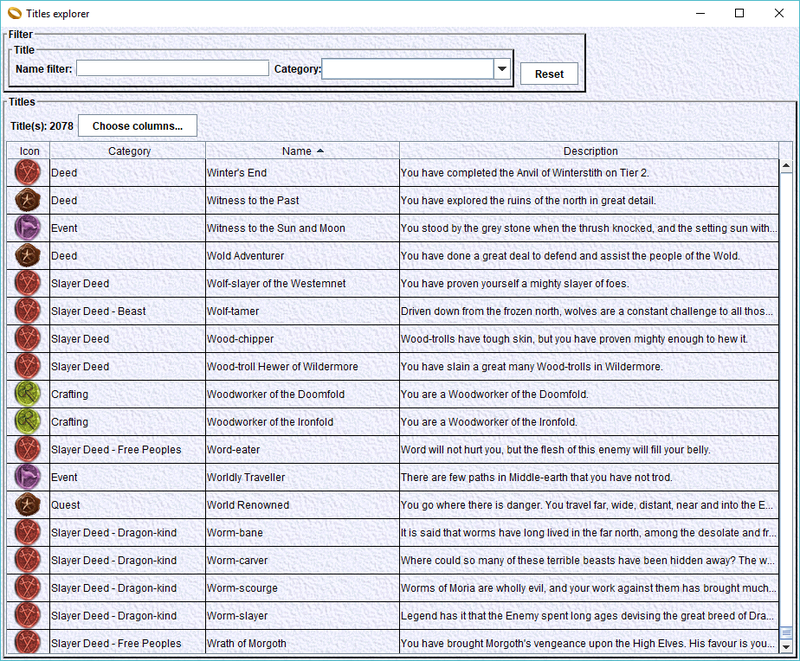 Such as storing your characters gear stats and item names in a text file on your own computer for example. I understand APIs have to have limitations, but I've always wanted an easy way for a crafter to see an alt's stats to decide whether or not to use precious materials to craft new items for that alt. I will be trying to use this app but can see data entry taking a lot of work especially as I have a lot of alts and I try to craft my own stuff. But well done on producing something so comprehensive, I will be trying it out in the next week or so! Hats off! I don't need to add web links. I'm not hard to find! For stats, I was thinking of a 'manual' mode where stats are not computed from gear but either grabbed from game or entered manually. The Tulkas plugin has a convenient (still manual, but largely automized) way of linking item IDs to icon/names. It will be rewarding to go the same direction. The 'link' thing is a good track to follow to get complete item instance data. Working on this and it works quite well (when the client successfully links items...). Released version 10.0.23.2 with updated data for Update 23.2 (items, essences, titles, recipes).